Often, at times, complex designs can be the result of simple harmonious orders. The idea behind this project was to create a walkthrough biology museum that reflects upon the latter. Inspired by the complex geometry of the human rib cage, the design is based upon simple mathematics. 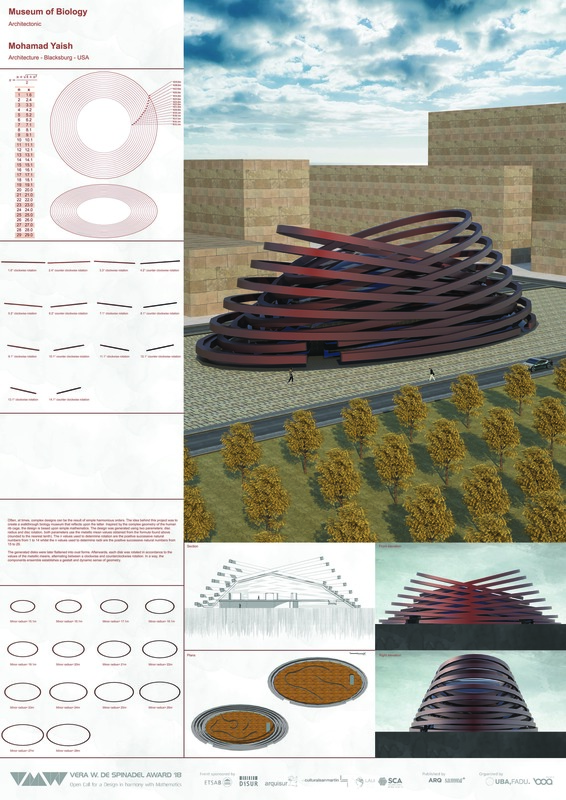 The design was generated using two parameters; disc radius and disc rotation. Both parameters use the metallic mean values obtained from the formula x=(n+√(4+n^2 ))/2 (rounded to the nearest tenth). The n values used to determine rotation are the positive successive natural numbers from 1 to 14 whilst the n values used to determine radii are the positive successive natural numbers from 15 to 29. The generated disks were later flattened into oval forms. Afterwards, each disk was rotated in accordance to the values of the metallic means, alternating between a clockwise and counterclockwise rotation. In a way, the components’ ensemble establishes a gestalt and dynamic sense of geometry.